Teams of eight to a table compete against all the other tables. 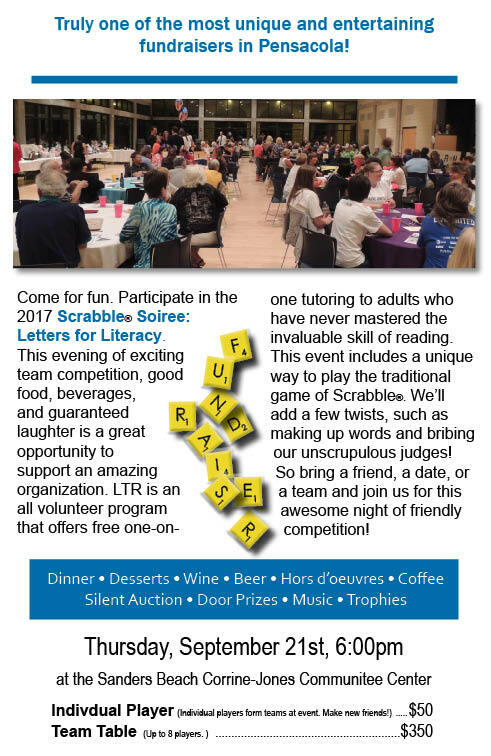 Teams put all their Scrabble® tiles on the table and make as many words as possible in the allotted time. Two rounds will be played. All teams start with the same word. Extra points may be earned by using all your letters, finishing first, coming in a team uniform (T-shirts with team name, headbands, hats, be creative). Players may purchase peeks in the dictionary and may also purchase extra letter tiles. We always encourage BRIBING our SPECIAL GUEST JUDGES to let “almost” words be counted. ALL FOR A GOOD CAUSE! INDIVIDUAL PLAYERS will be seated at a table with other players to form a team of eight. Come by yourself and make new friends, bring a date, or form a team. Thank you for supporting Learn to Read of Northwest Florida as we continue our mission to provide free one-on-one tutoring to the thousands of area adults who are functionally illiterate. Hope to see you at this event!